This was good news indeed, as, when I tried to find a book to read from Oman back in 2012, there was precious little available. Apart from the collection of fairy stories I eventually got my hands on, there was almost nothing in English. This month, I at last made it to Camila’s recommendation on my teetering to-read pile. And I was very glad I did. Starting with the return of government employee Khalid Bakhit to the remote village of his birth, the novel reveals the tensions and historical ties that bind and warp human society. It brings together the accounts of everyone from Ayda – the only woman in the place ever to have gone to university – to dark-skinned servant Khadim, and depicts the build up to a coup that threatens to break the community apart, spilling secrets with the power to kill. Neatly plotted and containing some genuinely surprising revelations, much of the book makes for engrossing reading. Al Farsi certainly seems to enjoy playing with suspense: he deftly foreshadows disasters and, in the case of one passage towards the end of the book, even describes a funeral while withholding the identity of the corpse until almost the very last line of the chapter. Stories nest within stories. There are funny anecdotes, such as the description of how the village mosque’s call to prayer came to be shared unorthodoxly between two muezzins, and the tale of Imam Rashid’s insistence on keeping time using his rooster. And there are much more poignant and sometimes shocking accounts that, collectively, work to round and ground the characters in the story. 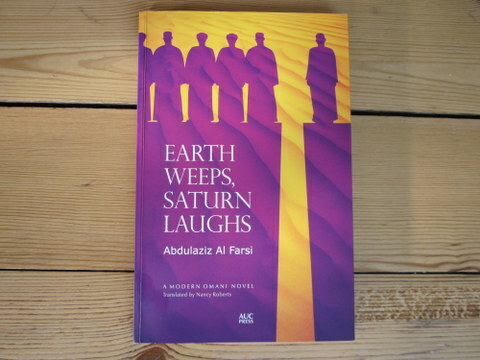 The novel’s multiple voices and perspectives afford Al Farsi great scope to move between registers, from earthy, humorous observations about vanity, misconceptions and back-biting, to lyrical portrayals of loss and love. Several times, I found myself surprised into delight by succinct encapsulations of experience – the claim that ‘it was as though he had drawn in the reins of the scene and placed them in my hand’, for example, or the observation that ‘Our problem when it comes to love is that we always want those we love to match the image we’ve drawn of them in our mind’s eye’. Translator Nancy Roberts, who has also translated Mahfouz and Nasrallah, deserves credit for the beauty that often shimmers in the prose, as well as her skill in making the story’s sometimes unfamiliar mores and references comprehensible for anglophone readers. It’s like what happens when a man walks all night long, then falls asleep from sheer exhaustion. The next morning he wakes up and finds himself lying on a railroad track. He hears a train approaching in the distance, but he doesn’t feel like moving his body. He says, ‘I’m all tired out from my long trip, and the train’s still a long way off. When it gets closer I’ll do something.’ […] Then, just when the time comes for him to act, he’s overcome by drowsiness, and the train runs over him. For all its strengths, however, the book is not without flaws. Some of the metaphors miss the mark – I was rather wrongfooted by the imagery of someone being chased by a wound at one point. In addition, the myriad voices and sometimes cacophonous presentation of scraps of dialogue within a single paragraph can be confusing (although it’s testament to the strength of Al Farsi’s characterisation that the key figures in the story almost always remain clear and distinct). Finally, a few readers may find the whimsical figure of the Saturnine poet a bit hard to take. On the whole, though, this is an enjoyable and intriguing novel. It reveals the duality of the ties that at once link us to communities and ground our identity, yet may also throttle our individuality and limit our freedom to be ourselves. A welcome addition to the tiny library of Omani literature in English translation. Thanks for the tip, Camila. Good to hear that there is an Omani novel available in English! The luxury of my own, much slower, travels around the world is that I get to put off the most difficult countries in the hope that something will become available before I get to them. Looks like that strategy worked in this case! Indeed! What’s the latest with your project? Sounds wonderfully interesting and intricate. I love books with various layers-will definitely have to check it out. I think it varies hugely from book to book and translator to translator – impossible to generalise about! I’m intrigued after reading your review – I’m adding this book to my TBR list. Thank you for helping me prepare for a trip to Oman by pointing me a great work of fiction.I appreciate the tip and have also ordered it for my library collection. My pleasure – enjoy your trip!